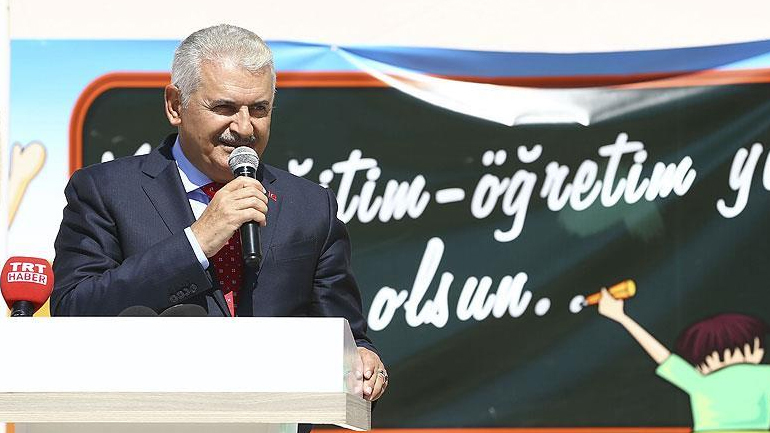 Prime Minister Binali Yıldırım on Monday called on teachers in the country not to show any tolerance to their colleagues who are sympathizers of the faith-based Gülen movement or the terrorist Kurdistan Workers’ Party (PKK) and not to allow them to continue doing their jobs. “Dear teachers, I have an important request of you: Never show any tolerance to the pro-FETÖ and separatist movements and your colleagues who serve them. Don’t allow them to be among yourselves,” Yıldırım said at a ceremony in the eastern province of Erzincan marking the start of the new school year. FETÖ (Fethullah Terrorist Organization) is an acronym the Turkish government has been using to refer to the Gülen movement, inspired by the ideas of US-based Turkish Islamic scholar Fethullah Gülen, despite the lack of a court ruling that proves any terrorist activity on the part of the movement. Yıldırım’s call comes at a time when thousands of teachers have been suspended or dismissed from their posts as part of an ongoing witch-hunt against the Gülen movement under the emergency rule declared in the aftermath of a failed coup attempt on July 15. Turkey also suspended more than 10,000 teachers from their posts due to their alleged links to the PKK. Turkey’s Justice and Development Party (AKP) government, which launched a war against the Gülen movement following the eruption of a corruption scandal in late 2013 in which senior government members were implicated, carried its ongoing crackdown on the movement and its sympathizers to a new level after a failed coup attempt on July 15 which killed 240 people and injured a thousand of others. Although the movement strongly denies having any role in the corruption probe and the coup attempt, the government accuses it of having masterminded both despite the lack of any tangible evidence. Turkish Islamic scholar Gülen called for an international investigation into the coup attempt, but President Recep Tayyip Erdoğan — calling the coup attempt “a gift from God” — and the government initiated a widespread purge aimed at cleansing sympathizers of the movement from within state institutions, dehumanizing its popular figures and putting them in custody. The beginning of the new school year on Monday for 18 million students and 900,000 teachers has been overshadowed by the ongoing purge of educators. Education unions called on authorities to postpone the beginning of the new school year due to a shortage in the number of teachers. Nearly 1 million students are expected to be affected by the purge as they have had their teachers suspended or sacked from their posts by the government, Veli Demir, the head of the Eğitim-İş union, said on Friday. About 50,000 teachers have been dismissed or suspended by the government from their posts due to their alleged links to the Gülen movement. In the meantime, ceremonies at schools on Monday were dedicated to the commemoration of the “July 15 Democracy Victory and Martyrs” in accordance with an order from the Education Ministry.